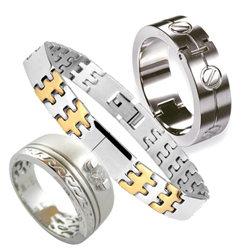 Shop for men's wedding bands, fashion rings, religious items, bracelets, cuff links, tie pins and more at Jim Green Jewelers. 14k yellow gold mounting with three brilliant round cut diamonds. The mounting features a satin finish. The item number is JADMSAH4163. Please call for pricing information. 14k white gold men's band with .48ct in brilliant round cut diamonds. Item number is JAD6162SRY. Please call for pricing information. 14k yellow gold tarpon pendant with diamond eye. Item number 100490. Please call for pricing information. A gorgeous sapphire is bezel set in this 14k yellow gold ring. The sapphire weighs approximately 5.00ct. Item number 100791. Please call for pricing information. 14k yellow gold men’s ring with square cut rubies and channel set round brilliant cut diamonds. Item number 100629. Please call for pricing information. 14k yellow gold men’s ring with two brilliant round cut diamonds set in the center, and eight smaller round accents diamonds set on either side. The total diamond weight is.50ct. Please call for pricing information. 14k yellow gold bezel set sapphire ring. The sapphire is surrounded by diamonds. Please call for pricing information. Sterling silver shark tooth pendant with Koa wood inlay. 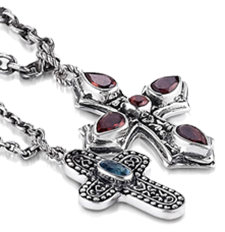 The pendant is hung on a 24” sterling silver rope chain. Please call for pricing information.